My Kitchen Rules winners Sammy and Bella share an easy dinner recipe for a salad that’s bursting with delicious Thai flavours – and a great way to cook with healthy turkey! 1. Slice turkey breast into 1cm thick pieces. Thoroughly wash coriander, pick and reserve leaves. Roughly chop remaining roots and stems and place in a mortar and pestle along with garlic and salt. Pound into a smooth paste, then mix with olive oil and coat turkey generously. Allow to marinate for at least 1 hour, preferably overnight. 2. Bring a pot of salted water to the boil. Cut snake beans into 3cm batons and blanch for 30 seconds, then drain and allow to cool. Slice avocado and cucumber, chop chilli. Roast cashews until golden and fragrant. Allow to cool. 3. Place turkey under a hot grill and cook for about 3 minutes on either side, or until cooked through. 4. For the dressing, remove pulp from passionfruit. Remove stems from kaffir lime leaves and chop very finely. Whisk passionfruit pulp, kaffir lime, lime juice, fish sauce, sugar and grated ginger until the sugar has dissolved. Check for seasoning to make sure there is enough saltiness, sweetness and acidity. 5. 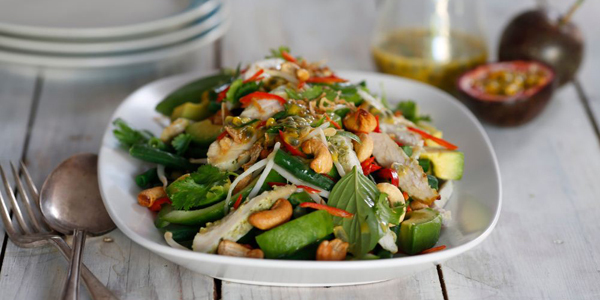 For the salad, mix snake beans, avocado, cucumber, chilli, cashew nuts, bean sprouts with half the dressing. Spread on a wide flat serving plate and top with turkey, basil and coriander leaves and a sprinkling of crispy shallots. Drizzle over remaining dressing and serve immediately. 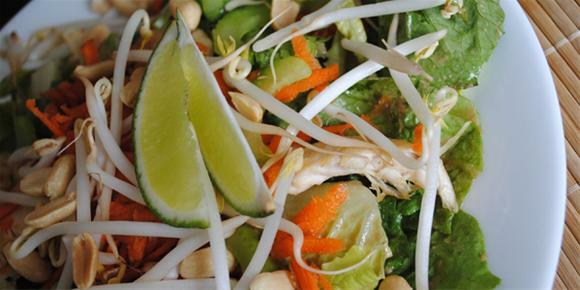 What’s your favourite Thai recipe? A curry that’s on the table in 30 minutes? And it’s low in fat, too? 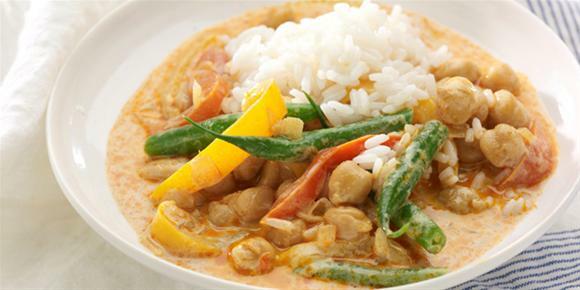 Ditch the greasy takeaway and choose this healthy, fragrant Thai red curry for dinner tonight. Don’t want the veggie version? Throw in a handful of prawns, leftover roast chicken or free-range pork strips right at the end. 1. Heat the oil in pan. Add onion and capsicum and sauté until soft, approximately 3 to 5 minutes. 2. Stir in the curry paste and coat vegetables. Add the stock, green beans, and chickpeas and stir to combine. 3. Simmer for 20 minutes. Remove the heat and stir in Chobani. Add salt and pepper to taste. Vegetable curry? Seafood curry? Meat curry? What’s your favourite curry recipe? Mussels are quick to prepare, healthy, sustainable, and a breeze to turn midweek dinners into something special. 1. Heat oil in a wok or large saucepan over medium-high heat. Add garlic, spring onions, lime zest and curry paste; cook until fragrant and the paste is sizzling. Add lime juice, coconut milk, brown sugar and fish sauce. Bring to a boil and let cook for 2 minutes. 2. Add mussels, return to a simmer, cover and cook for 5 minutes, until the mussels open. Discard any that do not open. 3. 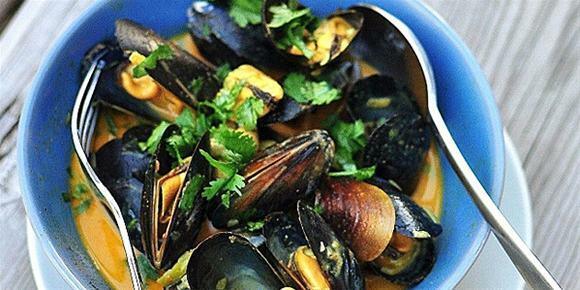 Serve the mussels over rice or with crusty bread to mop up the delicious juices. Garnish with coriander. Heat a little oil in a wok or large non stick frying pan. Add the sweet potato and cook for 5 minutes or until softened. Add the Thai Red Curry Simmer Sauce and 1 cup water, cook for 5-8 minutes then stir through the red capsicum and green beans. Simmer over low heat. While the curry is cooking, heat a little more oil in a non stick frying pan and cook the duck (in batches if necessary) for 3-4 minutes each side or until cooked to your liking. Drain well on paper towel. To serve, combine the pineapple, chilli and coriander. 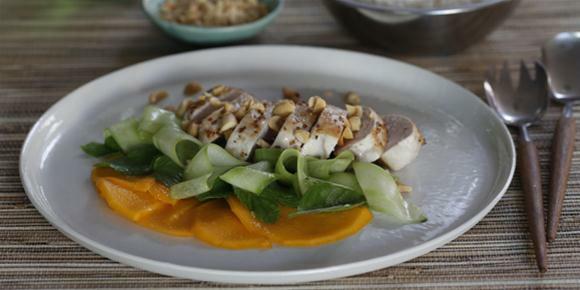 Divide the vegetable red curry among serving dishes then top with a duck breast. Serve with pineapple mix on the side. What’s your favourite afterwork dinner? To make dressing: Place all dressing ingredients in a small mixing bowl and combine well. To make salad: Divide salad ingredients equally over 4 dinner plates. To prepare noodles follow instructions on packet. Coat steak with Thai seasoning. In a non-stick frypan that has been generously coated with cooking spray, fry steak until cooked to your liking. Cut into thin strips and leave to one side. 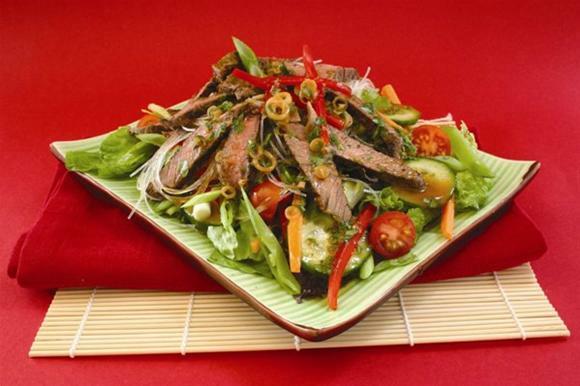 Place noodles on top of salad then put rump slices over top. Pour dressing over salad. VARIATIONS: REPLACE STEAK WITH 400g LEAN LAMB LEG STEAKS,400g SKINLESS CHICKEN BREASTS, 400g PEELED RAW PRAWNS OR 400gTOFU DICED. Annette’s cookbooks SYMPLY TOO GOOD TO BE TRUE 1-5 are sold in all good newsagencies or visit Annette’s website www.symplytoogood.com.au to see her extensive range of weight loss products and sign up for her new and exciting 28 DAY MIND BODY WEIGHT LOSS PROGRAM.